Defne Güntürkün is a textile design professional. She received her bachelor's and master of arts degrees at Mimar Sinan University of Fine Arts in Istanbul. Aside from her professional activities in designing fabric patterns as a freelancer, she has taught herself how to embroider in the past few years. This led to a leap forward in her pursuit of art and creation. Her long–term practical experience in mostly nature–inspired fabric design is reflected in her embroideries. She recently started a small business through her website where she makes her embroideries available for purchase. She has an arts studio in a historic district in downtown Istanbul, where she spends most of her time doing what she loves. Check out more of her amazing work on her instagram or website. The internet is a great tool to be in regular contact with people and reach out to the outside world. It allows individuals like myself to expose their work to the world and facilitates an effortless way of exchanging ideas. I believe I had a chance to utilize the internet to a very large extent in terms of reaching out to people whom I would have never met in real life and share my work with others. For example Instagram has helped me a lot. I share my work with others, get reactions, see what is most liked and it directs people to my shop. I can easily say, I built my small business through it. It allowed me to open an online shop which I think is more effective than a physical shop, this way I can reach out to a bigger audience. My inspiration does not arise from a single source. I am greatly inspired by the environment that I am interacting with. Nature is an unlimited origin of inspiration which is manifested in my work. 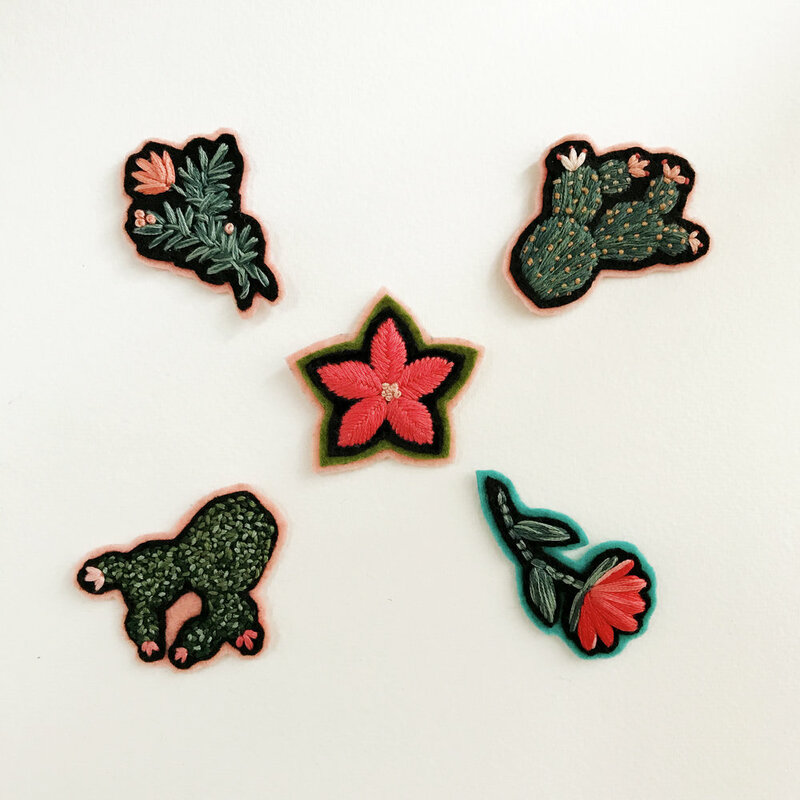 Since I have been designing fabric patterns for over 15 years, I have a comprehensive knowledge dealing with color combinations, exploring different kinds of plants, objects, etc., and illustrating them has been helping me a lot with my embroideries. So I think jumping in between designing patterns and making embroideries is a natural inspiration. Most of the time an idea pops up in my mind and I am eager to start exploring it. I sketch very rarely, usually I draw on the fabric right away and see where it takes me. At this point if I need to, I use photos I have taken or searched through internet, such as details of a plant, proportions, etc. One of the things I am paying attention to when I start a new project is that it needs to be unique. When you publish an art piece online, you kind of take the risk for it to be open to public which you cannot follow where it ends up. You can not control whether it will be used without your permission or copied but we all know that there must be a limit to “inspiration”. It is ok to be inspired until a certain extent but when it becomes a direct copy (mostly a sloppy one), that is the place to stop. I have been seeing similar works to mine or partially copied works. Although I have chosen not to confront those cases until recently, I found out that two people made exact copies of my work, not just one, but many, strangely on the same day. My instant reaction was reaching out to those people and asking them to remove the work from all social media. They were even selling the copies and seemed to be proud of coming up with a great idea. I have to admit that it made me angry. So I asked them in a polite way and in the end made sure that they know, if they do not remove the work and keep making new ones, I would take a legal action. How I found out was with the help of great people that notified me. Feeling this support of others is way stronger than the disappointment of my work being infringed. I receive messages from people when they see a copy of my work, or a post sharing my photo without crediting me, there are other very nice people who makes me feel that I am not alone and there are others also looking out for me. My main advice is to be original. I believe everyone has their own style but sometimes they may be scared to discover it. It may pretend to be easier to look like someone else who has been already successful but it will be a lot more satisfying to create your own unique work and see people appreciate it. This needs a lot of practice and patience but the result is worth it. Capturing a good image of your work is as important as the quality of your work if your audience is online. I sometimes see a great artwork but a terrible photo of it, which makes me think that you should definitely pay attention to taking good quality photos of your work. About selling your work, I know it is a tough one! Most of the talented artists I know do a great job in art but are bad at marketing. I know it is the nature of being an artist, it is hard to put a price on one's work and deal with the technical parts of marketing your work. I opened my website a couple of months ago and in the beginning it seemed like too much work that I did not want to deal with. I ignored my fear and went for it, so you can do it too. I am surrounded by artists and it is a great feeling. My husband Benoit Hamet is an illustrator , my best friend and studio partner Gözde Başkent is a painter. So we share the same studio and they inspire me everyday. We always exchange ideas.